Get tailor-made hydration for your combination skin with the Nuxe Aquabella Beauty-Revealing Moisturising Emulsion, an ultra-fresh moisturiser with a ‘bare skin’ finish. Created especially for those with both oily and dry areas, this lightweight formula instantly melts onto skin to smooth, refine and reveal radiance. From the first application, skin becomes well-balanced and takes on a dewy glow. Part of the Aquabella skincare collection, the Beauty-Revealing Moisturising Emulsion contains a combination of waterlily and hyaluronic acid which work together to hydrate all areas of the face. In addition, Nuxe’s patented Natural Blur Complex visibly improves the look of skin with smoothing oat sugars, pore-tightening green lentil extract and radiance-boosting nasturtium extract, creating a lasting improvement in skin texture. 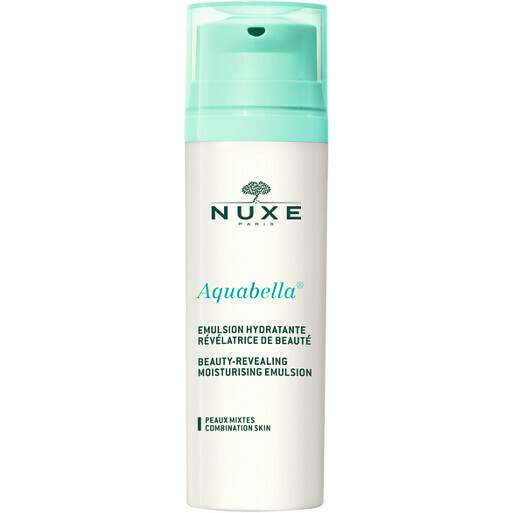 Apply both morning and/or evening to the face and neck after using the Aquabella Beauty-Revealing Essence-Lotion. Free from parabens. Non-comedogenic. 93.5% ingredients of natural origin. Nuxe Aquabella Beauty-Revealing Moisturising Emulsion 50ml is rated 3.0 out of 5 by 2. Rated 1 out of 5 by Patti9 from Not as description I have dry skin and this was used twice before binned. Did not like the fragrance and saw no advantage to the product, certainly not a soft dewy outcome. If companies 'believe' in their products, they should provide samples.